It's no secret that I am obsessed with Seche Vite topcoat for my nail art. It's thick, glossy, doesn't smear, and dries so fast. So when I heard Seche was coming out with a line of lacquers? My curiosity was more than piqued! I had the opportunity to play around with the Bright and Bold collection, which includes six lacquers in purples, pinks, and red-oranges. They all look beautiful together and the purples are so up my alley. I began with a base of Seche Not Easily Swept Away, a lighter lilac shade. The formula was impressive; I achieved full coverage in just two thin coats. I think if you had a heavier hand with your coats, you could even get away with one. That's a big deal for lighter shades like this! 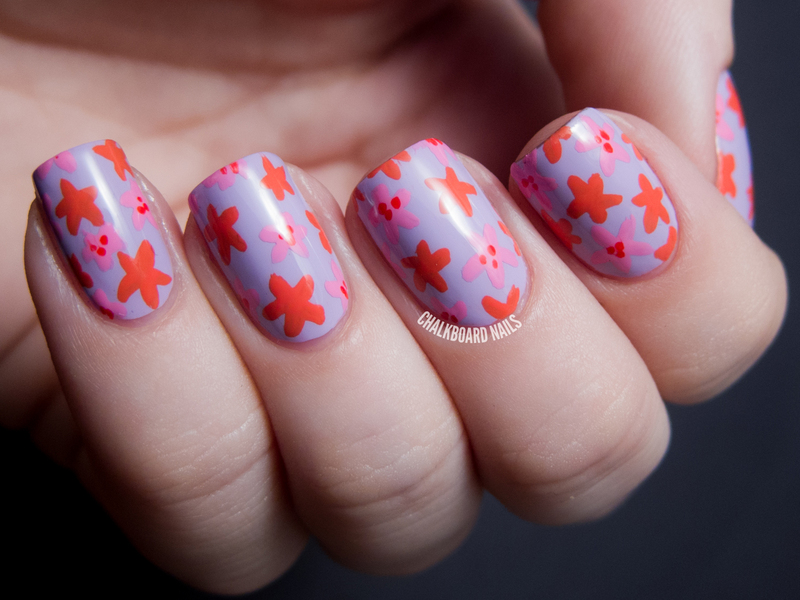 Then, I added small flowers using Seche Wild One (the orange) and Seche Pretty Little Heartbreaker (the pink). To finish off the look, I added dots in the middle of the pink flowers using Seche Scorchin' Hot, a fiery red. Based on my experience using the shades in my nail art, I would venture to guess that Pretty Little Heartbreaker is similar in formula to Not Easily Swept Away, and Wild One and Scorchin' Hot would only need one coat when worn alone. 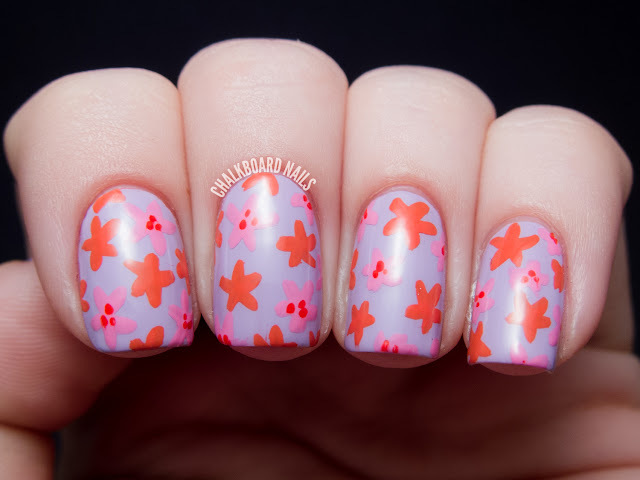 I know floral isn't exactly groundbreaking (for spring or otherwise), but I just can't get enough of these little full nail floral patterns. They're easy, take almost no time to do, and look fresh and fun. Overall, I was really impressed with my first Seche lacquer experience. Of course, I topped the whole manciure off with a generous coat of my bestie -- Seche Vite! Seche lacquers are available on Ulta.com, though this particular collection isn't on there (yet?). You can also find them on Head2Toe Beauty, and in professional salons and beauty supply stores. Be sure to check them out on Facebook and Twitter for more info. All of the swatches I post on my blog are with SV topcoat and without flash. While I appreciate the feedback, I don't have any plans to make changes to my photos at this time. I personally feel like I have the right amount of shine -- they look shiny without distracting from the nail art. And after all, this blog is all about the nail art. Super cute! i can never get enough florals! How much is shipping at Head2Toe Beauty? I would LOVE to get my hands on these! I havent shopped there in a while, but I think the minimum is $8? That will cover a large number of polishes though. I think. So cute! For some reason I thought this design looked like little starfish, especially the pink ones. It's almost like the orange flowers are the top side f a starfish and the pink flowers and the underbelly of the starfish. I like it and those cools are fab! This is so cute! Perfect for the fall, love the colours! These colors are so unexpected together but I love it! Very pretty, I thought they were starfish at first too like another poster said. Wow... beautiful colors, amazing pattern. Gorgeous one!